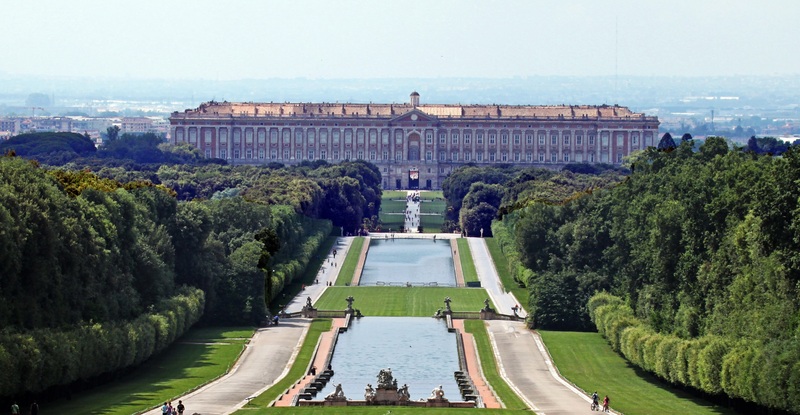 It is difficult to imagine a more spectacular surprise on the outskirts of Naples, amidst the “architettura fascista” of the cities notoriously ugly preferia (suburbs), than the Reggia (Royal Palace) of Caserta. Though Charles VII initiated construction on the palace, he was never to spend one night in the structure. In 1759 he abdicated to become the King of Spain. It was left to Charles’s third son, Ferdinand IV of Naples, to bring the palace to its near completion. Vanvitelli’s original plan included two large colonnades, never realized, comparable in size to Bernini’s monumental installation surrounding St. Peter’s Square in Rome. Following Luigi Vanvitelli’s death in 1773, his son Carlo assumed responsibility for the project. It was during the sons’ oversight that a garden of over 300 acres was designed and installed. The water garden extends nearly one half mile where, in 1780, an English Garden was designed and installed by Johann Graefer, a German born, English trained landscape architect. The garden design is also complimented by a floral garden on the east side of the palace. The design and scale of the beautiful and complex water features and garden have been compared to those of Peter the Great’s palace, Peterhof, in St. Petersburg, Russia. Visits to the palace offer a number of tour itineraries and options. Visit the web site (see IF YOU GO below) for further details. The most important rooms in the palace are the King’s Theater, modeled after the Teatro San Carlo in Naples, Throne Room, Staircase of Honor and Palatine Chapel. The most impressive exterior view of the Palace and estate is from a high point in the gardens. Visitors can easily reach the main entrance at the Palace using the regional train system from Napoli Centrale to Caserta. The grand approach to the palace is directly across the Sottovia Carlo Vanvitelli from Caserta’s station. Stunning. Breathtaking. Unbelievable. These are words that somehow inadequately describe this palace of unforgettable beauty. 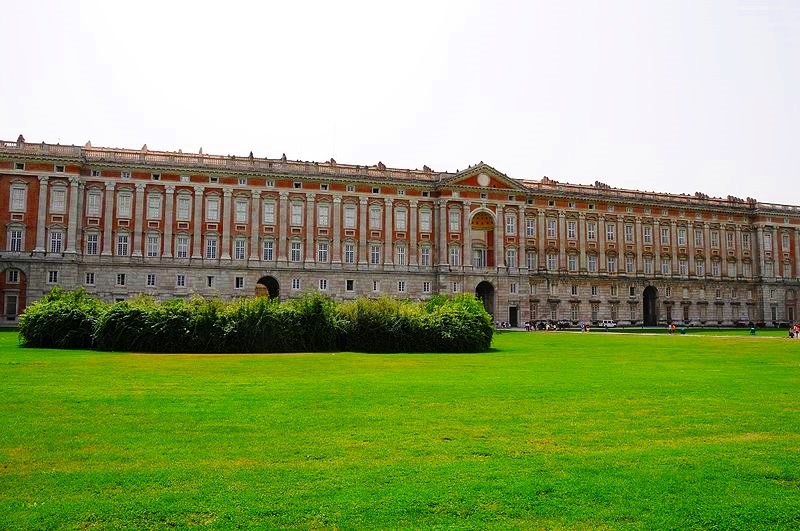 If you are planning a trip to Naples and the Amalfi Coast, I highly recommend at least a half-day visit to the Reggia di Caserta and gardens. Train service from Napoli Centrale begins very early during the week (5:09AM) and trains run approximately every forty minutes. The trip takes approximately fifty minutes each way. For further schedule details refer to: www.virail.com or www.trenitalia.it.